One of the hardest things to deal with during a home sale are inspections. Home Inspectors are picky and they find most flaws that exist in any home. Many times, items that started out as small issues are neglected by homeowners and they become large and expensive issues that need attention during the home sale. If you pay attention to your home and watch for problems and correct them early, you will save money and if you decide to sell your home, the sale process will become much easier. Here are a few tips on how to maintain your home. Your home is your castle. You want to make sure that it looks great on the inside and out. Just like an automobile, a home requires a great deal of maintenance. However, most people think that if it's not broken, then they don't need to fix it. 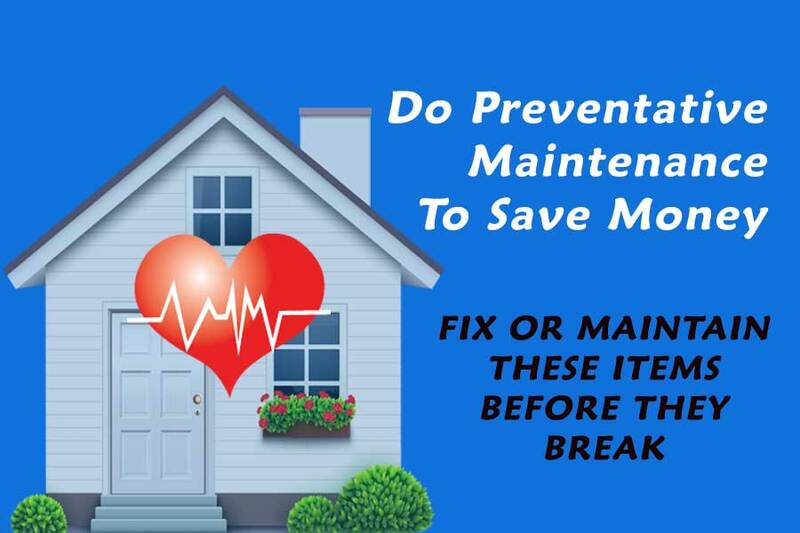 You can save a great deal of money by doing preventative maintenance on the home. Here are some items you need to fix or maintain before they break. Your home's heating and cooling systems are of the utmost importance. You rely on this unit to keep you cool in the summer and warm in the winter. However, few know that it requires a yearly inspection. If you have a gas powered unit, an inspection could save your life. As a unit begins to age, rust holes form in the heat exchanger. A technician can identify these holes and keep carbon monoxide from leaking into your home. Additionally, you need to make sure that you change your filter once a month. Maintaining your unit will extend its longevity. Did you know that a home warranty program doesn't have to cover an HVAC unit if it has not been maintained? When a drain is not allowing the water to exit in a timely manner, people grab the plunger and head to the hardware store for a chemical drain cleaner? However, the real problem is a clog. Drain cleaners can get some minor issues resolved, but you could have an issue deep in the pipes. It is imperative to call for professional help when you have toilets and sinks that constantly are clogged. You could have a problem with the main sewer line. The last thing you want is sewage filling up in the yard. Consequently, it never hurts to have your system inspected and ensure that things are running well before the winter season. The electrical components of a home are vastly important to your family being able to live in the home. If you have an older home, you may have knob and tube wiring. Older homes may also have a fuse box system rather than the new breaker box type. Additionally, a breaker box may be ill-sized for the home and cause breakers to flip off constantly. The electrical system in your home should not be put off. If you wait until it's too late, it could result in a fire that causes great damage to the home. If any part of your electrical system is not functioning properly, you need to call in for professional help at once. The roof shields the home from the sun, wind, and rain. It allows your home to retain heat and it gives your abode a stylish look. However, the average roof only lasts about 20 years, if you have asphalt shingles. When a roof gets close to the end of its lifespan, shingles may become brittle and start blowing around your yard. You may or may not even notice that your shingles are starting to drift off. However, it leaves empty spots where rain and debris can get to the sheeting. People get leaks on the inside of the home when the sheeting is damaged. Unfortunately, this allows the rain to slip through. Never wait until your roof is leaking in the house to do something about it. Make sure you have a great roof and it is within its lifespan. Waiting until the last minute could cost you thousands more in unnecessary repairs. Routine maintenance is as important as paying the mortgage each month. The longevity of your systems and the home's structure depends on it. THIS WEEKS HOT HOME LISTING! AND HERE'S YOUR MONDAY MORNING COFFEE!! Hey !very nice post. This post is really useful. Thank you for sharing your good information. Homes for sale in the Eugene area are only a click away! Know what's happening in the Eugene housing market, sign up for our newsletter today!